Chemical storage is a process that requires much consideration and careful planning to achieve safety and compliance. There are regulations in place by federal, state, and local agencies to promote safety in a chemical storage environment, protecting the community and environment as well as the facility’s personnel. Proper chemical storage is crucial not only for safety, but it protects your assets and helps you avoid unwanted hefty fines. Chemical storage, however, doesn’t have to be an overwhelming process. U.S. Chemical Storage can facilitate the process by helping you meet chemical storage regulations. Fully understanding chemical storage regulations requires a good deal of research in every level of government. Oversight could result in fines down the line. Thanks to U.S. Chemical Storage, however, we can streamline the process to help you become fully compliant. There are a number of responsibilities on your part, for instance, building permits, site location, final inspections, and maintenance. The full list can be found here. The fact is, U.S. Chemical Storage is the most trusted name, sought out by individuals, major corporations, and government agencies alike. Our buildings meet regulations and are FM Global and Warnock Hersey Approved. Incompatible materials, such as flammables and oxidizers, should be stored separately. Fungicides, herbicides, and insecticides should be stored separately. Some materials are required to be reported when stored above a certain amount. Make sure you know whether or not your materials qualify. Signs should be posted to alert the surrounding personnel to hazardous materials. Flammable and unstable materials require fire rated storage and fire- or explosion-proof electrical systems. Regular maintenance and proper housekeeping is required to ensure safety. Certain materials cannot come into contact with organic materials such as wood. 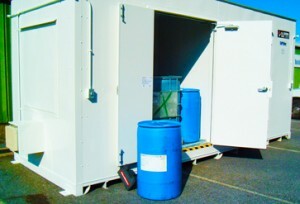 Secondary containment should be able to hold at least 100% of the volume of the largest container. This list only describes a few situations and chemical storage regulations. For full access to chemical storage regulations, consult federal, state, and local agencies.